The binturong (Arctictis binturong) is a large, rare mammal that lives in trees in the dense forests of southeast Asia. 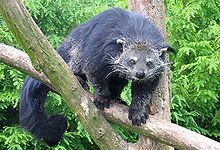 The binturong is also often called a bearcat because it looks like both a bear and a cat. Binturongs have thick, black fur, a long, muscular tail, and long, stiff, white whiskers. They use their prehensile tail almost like another hand; young binturongs can even hang by their tail. Binturongs grow to be up to about 5 feet (1.5 m) long. Like other civets, the binturongs use scent marks to communicate with other binturongs. In captivity, binturongs live for about 30 years. Binturongs eat fruit and small animals that they find using their sense of smell to find food. They hunt for food at night - they are nocturnal. This page was last changed on 29 December 2017, at 05:05.